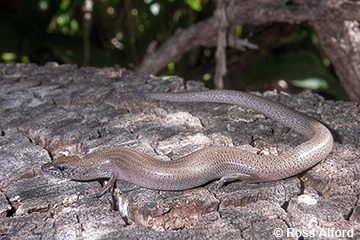 This skink is typically found under rocks and logs in dry rainforest and woodland habitats. The body is a coppery-brown to brown with a darker face, lower surface is cream or yellowish with some brown markings, there is no sharp contrast between the flanks and the back. Limbs are very short.